The first thing people notice about the CLA is its unique styling. Mercedes-Benz classifies the car as a "4-door coupe," much like its older sibling, the CLS. The comparison is apt, as the CLA borrows much of its design language from its bigger brother. However, the base price of a CLA is less than half that of a CLS, making the CLA a relative bargain. The CLA utilizes a turbocharged 2.0L 4-cylinder engine in the base trim, which makes 208 horsepower and a very healthy 258 pound-feet of torque. Front-wheel drive is standard, with Mercedes-Benz's 4MATIC all-wheel-drive system as an option. The only transmission choice is a 7-speed dual-clutch unit, providing the efficiency of a manual with the functionality of an automatic. Performance is sprightly, with acceleration to 60 mph in just 6.9 seconds, while fuel economy is also respectable thanks to one of the most aerodynamic bodies ever sold in the U.S. In the entry-level CLA250, standard equipment includes 14-way power adjustable front seats, an 8-speaker CD/MP3/radio sound system, rear seat armrest with cup holders, an auto-dimming rearview mirror, rain-sensing wipers, rearview camera, heated mirrors, an 8-inch color screen, Bluetooth and an integrated garage door opener. Options are plentiful on the CLA250 and include items like LED headlights, a panoramic sunroof, a navigation system, heated front seats, PARKTRONIC parking assist, and a blind spot assist system. Equipment packages include a sports package with unique exterior details and upgraded brakes, an interior package with leather seating surfaces, a premium package with keyless entry and an uprated stereo and a multimedia package featuring a larger screen and a 6-disc CD changer. A convenience package features the hands-free access trunk lid, which requires only the motion of a foot beneath the rear bumper to open. 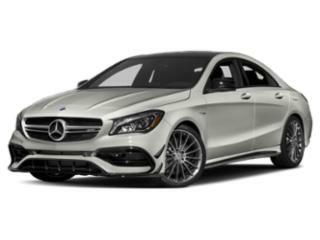 The high-performance AMG CLA45 features a special hand-built version of the same turbocharged 2.0L four-cylinder engine, but AMG has wrung an astounding 350 horsepower and 375 pound-feet of torqu — nough to propel the car from 0-60 mph in just 4.1 seconds. The AMG CLA45 is clad in unique exterior body styling, and inside there's Recaro performance front seats with contrasting stitching, among other AMG-specific amenities. A new DINAMICA suede interior package adds unique the material to seating and steering wheel surfaces. A big part of the Mercedes-Benz brand has always been safety. Standard safety equipment includes anti-lock brakes and traction control as well as stability control and several airbags for both the front and the sides of the car. Optional safety equipment includes DISTRONIC Plus, a radar-based cruise control system that can automatically apply the brakes if it senses a collision, as well as lane-keeping assist and blind spot assist.